go somewhere that might take me away. making it difficult to swallow. it's sunshine made from rain. "It isn't just my story that I am telling though I am here to tell it. It is the story of millions of people. It is a story that has been hidden instead of shared to its demise. Its invisibility has only perpetuated its mistreatment. " With all of the news coming out around Chronic Fatigue Syndrome (CFS) I felt it was time to tell my own experience with having this disease for the past 16 years. 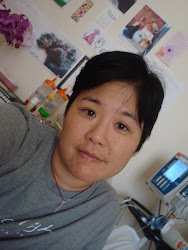 I've written an autobiographical short story: http://bealightcfsawareness.blogspot.com/2010/09/short-story-written-and-told-from.html. Please let me know any thoughts, ideas, critiques on this piece of work. I do believe that these stories need to be out there. People are reading about the evolving science, but don't necessarily understand the significance without understanding the experience. I saw a miracle yesterday. before the heat of the day had settled in. The brightest of lights lie ahead. opened the door and left. Propped pillows and a laptop. It's soot colored clouds today. Advocacy Success in San Franciso! SECURITY: Security came out immediately in the form of one person. He appeared to be the Head of Security for the Federal Building/HHS. Bobbi told him what they were doing and how she had been told by the city police that they could be on the sidewalk without a permit, as long as they didn't have a loudspeaker. The security officer agreed, took some of the demonstrators' literature and went back inside. It was all very relaxed. PRESS: The protest co-organizers, Bobbi and Rivka, a mother/daughter team, had spent the days prior reaching out to the press. Success! The New York Times reporter who has covered ME/CFS in the past came "to say hi" (no article expected, but good to keep relations going) and a San Francisco Chronicle reporter and cameraperson came as well. The resulting article is found here: http://www.sfgate.com/cgibin/article.cgi?f=%2Fc%2Fa%2F2011%2F05%2F25%2FBANA1JL1AH.DTL Though this article was disappointing in the usual ways, its publication was still good news, as the SF Chronicle is one of the largest papers in the region. Plus, the reporter said she hoped to do an additional story on kids with ME/CFS. And to our knowledge, this is the first time an ME/CFS protest has made news in the U.S.
As I have proceeded through 17 years of having CFS, I have encountered more and more individuals who also suffer from this terrible disease. I have had conversations with people who struggle to have the will to keep going even one more day, seen videos of people who cannot roll over in bed or even speak, people who have not left their homes for decades or have had to move from one home to another year after year because of financial dilemmas that have resulted from this disabling illness. Chronic Fatigue Syndrome is among the cruelest of diseases. There are no words to capture how it takes that moment where the train goes off the tracks, crashing into the earth in flames and makes that moment every moment of your life. All of this is terrifying to an undefinable degree, but what is most amazing to an equally undefinable degree, is that these same people are consistently the kindest, most generous, caring people I have ever encountered. I see people reach out to others they have never even met with the care and love of a parent or a partner. I see a connection and sense of community, where we are all acknowledging one another's brilliant and bright existence, outside and in spite of this illness. I don't know if CFS simply strikes the bright and the kind, or if the experience makes us so. Regardless, I wanted to share this with all of you who have CFS, and also those of you who don't and may not have the privilege of bearing witness to this community of humanitarians. A final thought. It strikes me in my heart whenever I hear of another person with CFS that this sort of thing isn't supposed to happen to angels. And as an angel would, these people gracefully spread their wings and continue to fly about the earth doing what angels do. "To the CDC and NIH scientists who’ve been doing this ludicrous research for three decades and sweeping a worldwide human catastrophe of 17 million people under the carpet, I say to you: Have you no sense of decency at long last?" Thank you for telling it how it is, Mindy. May is ME/CFS Awareness Month! Put a ribbon on your Facebook profile picture to show your support! This is an extremely thorough summary of Dr. Kogelnik’s talk “Re-Evaluating Chronic Fatigue Syndrome and Immunology” at El Camino Hospital in Mountain View on April 19, 2011. What advice would you give to others out there who suffer from ME/CFS? The most important thing I have learned in my 24 years with this disease is to listen to my body. Everyone with this disease has different boundaries, and we find out through trial and error where they are. It’s critical to know where they lie, because when ME/CFS patients overextend themselves, the result can be utterly disastrous. Several times, I have overdone it, leaving myself bedridden and desperately ill for years. Because many patients have been accused of merely being “lazy”—something I heard all the time in my first years with ME/CFS— they often push themselves too hard to prove they aren’t malingering. I did this myself, and paid dearly for it. So my advice is to always put your body first, listen to what it is telling you and respect those signals. I’ve been doing yoga for about a decade now, and it has been a godsend to me. Even when I’m quite ill, there are a few poses I can still do, and it’s wonderful for my body, keeping it flexible and maintaining muscle tone. It’s even better for the mind. Yoga relaxes me, alleviates stress, and quiets my thoughts. There is a beautiful and nourishing mindset that attends yoga, focusing on acceptance of yourself and your situation, living in the moment, awareness of the interconnectedness of all things, and cultivating gratitude for your blessings. There is so much loss, so much anguish, and so much stress involved in being as ill as I am; yoga helps me cope with it and love my life and all I have been given. Along with yoga, I practice meditation. No matter how sick I am, I can always meditate, and it always refreshes me and fills me with optimism. In spite of what the disease does to me, I’m a very happy person, and I credit meditation for much of that. In my sickest years, I sometimes meditated three times a day. I am also careful about the chemicals that go into my body. I try to buy products that are natural. I buy products from companies like Loving Naturals, which sells products that are organic, simple, natural and absolutely safe. I try to do this especially with products I use every day, like moisturizers and lip balms. Also, we only use nontoxic, natural products in our home, because we don’t want to breathe in harsh chemicals, and we don’t want to pollute the environment. or doing some other winding down from the day activity. but i should have died on sunday. that only the light can seep through. I've been asked to write a paragraph about living with CFS. My life with CFS was kicked off with a harrowing 3 months of pneumonia. I tried to pretend it wasn't happening by continuing pre-med classes, and dance, only to find myself in bed and in bone cracking pain at every minute I wasn't in lab or rehearsal. Slowly, piece by piece I watched the things that made my life mine fall away. Instead, it became doctors that didn't believe me, living back at home and wishing my parents a good time when they went out dancing at age 22. I broke down in anger and tears weekly, trying to cry out the unfairness. That was 16 years ago. CFS and I have a different relationship now. I realize it has sent my life down a very unusual path, one with unrelentless suffering, but also one that gives a person a lot of time to think and watch how people live. This horrific disease has given me the opportunity to really put together how and who I want to be, and that, oddly enough, has been precious. What do you do when you are too sick to do anything. I have had CFS for 16 years and more than anything, I think it is a challenge of endurance. I have taken up full time employment in being happy. I ask myself throughout the day, what will make me feel even a wee bit better? and that's what I do. I have a million hobbies that come and go. It's different for everyone, what brings you joy, but I do feel it is essential. It takes the spirit of a warrior to carry on under such circumstances. I am in fierce pursuit of joy. and then I don't for months and months. propping itself up against the wall. I believe that purpose can be made of all of this suffering. I photograph my chickens as each finds her way to bed at sunset. to remember that life is not so serious. and know that rarely have I been better.